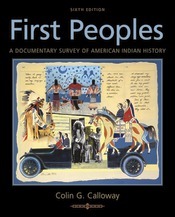 Expertly authored by Colin G. Calloway, First Peoples has been praised for its inclusion of Native American sources and Calloway’s concerted effort to weave Native perspectives throughout the narrative. Emphasizing the importance of primary sources, each chapter includes a document project and picture essay organized around important themes in the chapter. This distinctive approach continues to make First Peoples the bestselling and most highly acclaimed text for the American Indian history survey.